Eastern gray squirrels (Sciurus carolinensis), often thought of as cute, funny, adorable and highly intelligent animals. Unless they have taken up residence in YOUR residence! Squirrels, like most animals, can carry fleas, ticks, lice, even Rabies on rare occasion. Perhaps worst of all, the amount of damage those chisel-sharp teeth can do to your electrical wiring & woodwork! 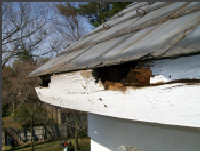 Squirrels can chew through aluminum siding, gutter and fascia wrap too. This makes it extremely important to trap and remove Squirrels before attempting any repairs. Relocating mama squirrel may mean raising the kits until they can take care of themselves; and squirrels generally have litters of one to four (but as many as eight) kits in both spring and early summer. To trap and relocate squirrels yourself, all you need is the right sized live animal trap, bait and some basic information to get started. ﻿To do this legally, especially as a paid animal control service, you will need to obtain a Commercial Wildlife Damage Control Operator or Assistants permit from the Maryland State Department of Natural Resources. This permit costs $50 annually for an Operator, and $25 annually for an Assistant. To obtain the permit, you must pass an open book exam found on the DNR website. You can request a printed permit for display purposes, although only the registered permit number is necessary. 1. Cover the bait tray with enough fresh crunchy peanut butter to keep the Squirrel's interest. Squirrels simply cannot resist the aroma and flavor of it! 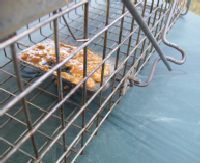 When the Squirrel bites the edge or steps on the bait tray, the trap doors should spring shut. 2. Locate the live trap fairly close to the point of entry. Squirrels are territorial so it isn't absolutely necessary to place the cage directly outside of the hole. You may find placing the live trap in an attic space with easy access most effective. This way you will remove the Squirrels actually causing the damage instead of some daring, curious & hungry passer-by. The photo to the left shows an example of what squirrels can do to wooden fascia. The gutter was removed for repairs. 3. Remove the caged Squirrel as soon as possible, after covering the cage with a towel or tarp, to a pre-approved area for release. Releasing the Squirrel a minimum of three miles away ensures that it will not easily find its way back. Do not allow the cage trap to sit in the sun any longer than necessary, since the metal can absorb enough heat to cause severe dehydration or death. 4. Release the Squirrel, following directions for the particular live trap used. Generally, this is done by flipping the locking bale(s) out of the way and sweeping the actuating arms downward to open the door(s). The Squirrel will usually fly out like it is spring loaded and make a run for the nearest tree. 5. Make all necessary repairs as soon as possible to ensure more opportunistic Squirrels do not move in. Removing the threat creates a vacuum of sorts, leaving the territory undefended. Create barriers. Move electrical service, cable and telephone lines. Trim tree limbs to remove access as necessary. * In Maryland (and surrounding States), juvenile gray squirrels start venturing out of the nest in early to mid May and late June to mid August. * Always secure the cage trap, to prevent it from falling or overturning, to prevent injury or accidental release. 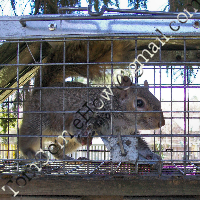 * Prop the cage trap up on sticks or pipe sections, to keep distance from surfaces Squirrels can damage while waiting to be transported and released. * Cover the caged Squirrel ASAP, with a towel or tarp, to calm it during cage handling and transportation. * Repel Squirrels with products such as 'Ropel,' or Fox urine (which you can purchase as a "cover scent" in most hunting/sporting goods stores). * Squirrels are not typically carriers of the rabies virus, since most attacks by rabid animals will KILL squirrels outright. * In Spring and summer, expect to find baby squirrel kits in the nest. Usually 1-4 kits per litter. Prepare to syringe-feed them puppy formula several times per day for a few weeks, or wait until they have grown and left the nest before making repairs. * Squirrels can chew through electrical wiring, cause a spark and burn your house down! * Keep fingers safely out of reach of caged Squirrels! Wearing leather-palm gloves provides some protection, although a Squirrel can still bite through them. * Caution about collapsible traps - they often have many open metal loops, at hinge points, which can cause severe injury to the fingers and toes of trapped animals! * Know the signs of Rabies, before attempting to trap and remove any animal. Rabid animals must be humanely euthanized by an animal ﻿control expert.